John McCain declared this is the most naive president in history. The Washington Post editorial board worries that Obama misunderstands the nature of the century we’re living in. Almost all of these critics ridicule John Kerry’s assertion that changing borders by force, as Russia did, is 19th Century behavior in the 21st Century. Well, here are the facts. The scholar Mark Zacher has tallied up changes of borders by force. Something that was once quite common. Since World War I, he notes, it has been on a sharp decline, and in recent decades that decline has accelerated. Before 1950, wars between nations would result in border changes, that is, annexations, 81 percent of the time. After 1950 that number dropped to 27 percent. In fact, since 1946 there are only 12 examples of major changes in borders using force, and all of them begun before 1976. So Putin’s behavior does in fact belong to the 19th Century. The transformation of international relations goes well beyond border changes. Harvard’s Steven Pinker, who will be on the show later, points out in a recent essay that after a 600-year stretch in which Western European countries started two new wars a year, they have not started one since 1945, nor have the 40 or so richest nations anywhere in the world engaged each other in armed conflict. Colonial wars, a routine feature of international life for thousands of years, are extinct. Wars between countries, not just major powers, not just in Europe, have also dropped dramatically by more than 50 percent over the last three decades. Scholars at the University of Maryland have been tabulating the number of new conflicts that have arisen across the world. They find that the past decade has seen the lowest number since World War II. This is not an academic debate. The best way to deal with Russia’s aggression in Crimea is not to present it as routine national interest-based foreign policy that would be countered by Washington in a contest between two great powers. It is to point out, as Obama did eloquently this week in Brussels, that Russia is grossly endangering a global order that has benefited the entire world. Compare what the Obama administration has managed to organize in the wake of this latest Russian aggression, to the Bush administration’s response to Putin’s actions in Georgia in 2008. That was a blatant invasion. Moscow sent in tanks and heavy artillery. Hundreds were killed. Nearly 200,000 people were displaced. Yet the response from the West was essentially nothing. This time the response has been much more serious. Some of this difference is the nature of the stakes. But it also might have to do with the fact that the Obama administration has taken pains to present Russia’s actions in a broader context and get other countries to see them as such. This is what leadership looks like in the 21st Century. There is in fact an evolving international order with new global norms making war and conquest increasingly rare. We should strengthen, not ridicule it. Yes, there are some places that stand in opposition to this trend: North Korea, Syria, Russia. The people running these countries believe that they’re charting a path to greatness and glory. But they are the ones living in a fantasy world. I had a great time seeing Vedora last night at Radio Bean. Friday is my Monday, so having them go on at midnight was the worst possible scenario, But, since bending time and space is apparently my new specialty, I figured out a path and made it to the show. I arrived just before 12 as the previous band was tearing down. They took lots of time and Vedora took a bit of time to set up, so it was 12:30 when the opening notes of Promises lit the room. They filled the next 90 minutes with their gorgeous pop songs that really rock. They have rearranged Maria and In The Pines, and they rock nicely. The bulk of the set was newer songs, many of which I’m really starting to like. Caroline O’Connor‘s bass playing drove the songs nicely. Her voice was lovely as always. Matthew Hastings singing was gruff and tough and his guitar work was the usual grandiose workout. The guy just looks like he loves to rip it up, and I love hearing him do it. Drummer Ian Moodie added lots of fills that helped drive the songs and everything sounded great. Late in the set they brought Matt’s brother James to the stage to play bass, while Caroline grabbed the sax for Careless Whisper. I’m not a fan of the song, but do love hearing Caroline on the horn. After that they went back to the rock, and the third to last song was something really special. Whatever it was, it rocked super hard and had me in a state of bliss. The packed hose at the beginning of the set slowly dwindled and Vedora played two more, wrapping up as the clock turned to 2am. In the end I had to put a lot of effort to get to the show, and every bit of it was heavily rewarded! I had a great time seeing music Wednesday night. I had missed Ryan Power the last two times he was in town, since he was playing Thursday evenings, when I was doing my radio show. Not so this time, a Wednesday was clear sailing for me. Radio Bean was pretty full when I arrived, so I found a corner to stand in, chatted with a couple of people, and soon enough the band was ready to go. The band were a five-piece with Ryan singing, playing keys, and guitar. Another guy played guitar and keys. The was a killer bass player and solid drummer, and another keyboard player, because the music had that many layers. The music was oddly timed gorgeous pop that challenged the heart and mind. It went in lots of directions, so the only chance I had to really enjoy it was to strap in and listen. The audience was almost evenly split between chatters and listeners, but it did not deter the band at all. They had to be amazing to pull off the songs, and they were, and they did. A lot of the music was electronic pop. Some had hints of prog rock. There were some elements of rock. It was the kind of set that really pushed my musical boundaries. They played most, if not all, of the new album Identity Picks, then tossed in some older ones at the end. Their 90 minute set was intense and wonderful and I had to work to catch up. In the end I’m glad I went. My mind was very stimulated by the show, but my heart didn’t love it. Music is such a funny beast. It can work in a lot of different ways, but in the end, the song you walk away humming is the one you loved most. I have yet to get to a point where his songs just pop into my head. Maybe that will happen someday, but for now the mind rules the heart, and I will see whet happens when I catch him in the future. Maybe the heart will catch up sometime. Barack Obama “The young people in the audience today, young people like Lara (sp), were born in a place and a time where there is less conflict, more prosperity and more freedom than any time in human history. But that’s not because man’s darkest impulses have vanished. Even here in Europe we’ve seen ethnic cleansing in the Balkans that shocked the conscience. The difficulties of integration and globalization, recently amplified by the worst economic crisis of our lifetimes, strained the European project and stirred the rise of a politics that too often targets immigrants or gays or those who seem somehow different. While technology has opened up vast opportunities for trade and innovation and cultural understanding, it’s also allowed terrorists to kill on a horrifying scale. Around the world sectarian warfare and ethnic conflicts continue to claim thousands of lives. And once again, we are confronted with the belief among some that bigger nations can bully smaller ones to get their way — that recycled maxim that might somehow makes right. So I come here today to insist that we must never take for granted the progress that has been won here in Europe and advanced around the world, because the contest of ideas continues for your generation. And that’s what’s at stake in Ukraine today. Russia’s leadership is challenging truths that only a few weeks ago seemed self-evident, that in the 21st century, the borders of Europe cannot be redrawn with force, that international law matters, that people and nations can make their own decisions about their future. 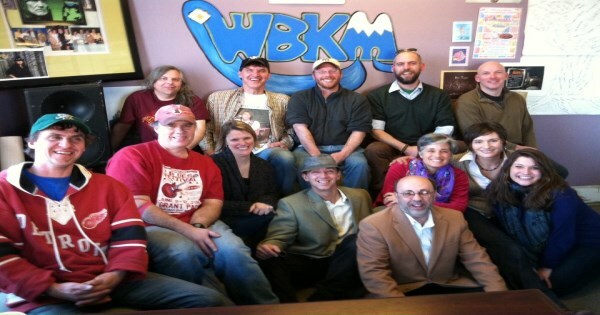 I just got back from my 55th local music radio show on internet only WBKM.ORG. I played a lot of music from bands I’ve seen in town and one I’ve never seen. From our small city to the great big world, these are the Sounds Of Burlington. It’s spring and the ground is covered with snow and ice. Aaah, Vermont. Last night I saw some really challenging music, so I’m going to open with a challenging song, then play some of the sweetest music to ever grace our town. This is a song called Well On Your Way by Ryan Power on WBKM and this is Burlington’s Kind Of Music. I really like that song from PossumHaw and thought it would sound great coming out of Basalt. Vedora are playing tomorrow at Radio Bean and Happy Birthday (yesterday) to Caroline O’Connor. Now it’s time for the next song on Dancing With The Big Guy. This is their sweeter pop side. I loved the few times I saw Hero. All of those are great songs that were played live in our town. I’m so lucky to live here! I’ve been loving the new show Cosmos with Neil Degrasse Tyson. Here’s a song about the joy of being smart. I love that song from Particles. They rock and Sasha Alcott is a science teacher when not a road warrior. There is another chance to purchase their upcoming album on pink vinyl. Phil and crew are playing Saturday at Radio Bean, and Swale are playing The Monkey House at the same time. Grrr. Wave are wrapping up recording their album. It should be out sometime in the near future. Last weekend I went out to see The Mountain Says No at Radio Bean, but made a stop at the OP to hang out with Mike Luoma and David L. Jarvis. After a bit I headed to Juniper to see Great Western, since Mountain were on later I love this song. I love that song from Mountain. The Crazyhearse CD has been hanging out at the station. I brought it home and liked that song. I’ve never seen them, but I’ve seen them listed at Club Metronome. I hope you enjoyed checking out the music of our town. Let’s do it again next week, shall we? FAREED ZAKARIA, CNN HOST: But first, here’s my take. Whatever happens in Ukraine over the next few months and years, the crisis has reminded me that there are really two kinds of rulers around the world, those who think about the past and those who think about the future. And if it weren’t abundantly clear already, it is now. Vladimir Putin is the first group and his country will be the poorer for it. We’ve all learned some lessons in Russian history. Crimea was the first great prize for Russia, wrested from the Ottoman Empire and a mark of Russia’s rise to great power status. It also gave the Russians something they never had, a warm water port with direct access to the Mediterranean and thus the wider world. Russia held onto the region even though it lost the Crimean War in the 19th century. Almost a century later it maintained its grip on the region after reclaiming it from the Nazis in early 1944. Then came the strange and fateful twist in 1954 when Soviet Premier Nikita Khrushchev gifted Crimea to the Ukraine, an internal transfer within the Soviet Union. Why Khrushchev did that remains somewhat unclear. Whatever the cause, the consequences are lasting and dramatic. That is the history. But history is bunk, as Henry Ford said. By that he did not mean that it was unimportant but rather that people should not be trapped by it, that they should not think backward but rather forward. The history that leaders make today has much less to do with geography or constraints from the past. When Singapore was expelled from Malaysia in 1965, the experts said that the small, swampy town in the middle of nowhere could not survive as an independent country. It is now one of the world’s great trading hubs with a per capita income higher than that of its erstwhile colonizer, Great Britain. That’s because its founder, Lee Quan Yu (ph), thought less about the disadvantages of history and more about the advantages of the future. When the Nationalist Chinese were abandoned by the world on a tiny island after the Communist Revolution in mainland China in 1949, most assumed the place would not survive. Yet in the most precarious position with zero natural resources, Taiwan became one of the world’s fastest growing economies for over four decades. That’s because it didn’t worry about geography. It obsessed about competitiveness. When Paul Kagame took over Rwanda, the country was more deeply ravaged by history than almost any nation. Scarred by a genocide of a speed never seen before in the past. Rwanda’s also landlocked with no geographic advantages at all and a bloody war in the neighboring Democratic Republic of Congo. But Kagame looked to the future, not the past. The result is a small African miracle, a country that is healing its wounds. There are those who are still trapped by history and geography; think of Pakistan’s generals, still trying to establish strategic depth in their backyard while their country collapses. Or think of Putin, who is, as Secretary of State John Kerry said, playing a 19th century game in the 21st century. What has he achieved? Ukraine has slipped out of his grasp, its people suspicious of Moscow even in Crimea the 40 percent who are non-Russian are probably restive and resentful. Moscow’s neighbors are alarmed and once warming relations with Poland will be set back, trade and investment with Europe and the United States will surely suffer. Meanwhile Russia continues along its path as an oil dependent state with an increasingly authoritarian regime that has failed to develop its economy or civil society or foster political pluralism. But no matter, Moscow controls Crimea. In today’s world, is that really a victory?